Beet salad with fresh basil and olive oil, sweet and fresh and earthy, becomes the center of our supper tables in late summer and early autumn when both beets and basil appear at market in abundance. Farmers sell half-pound bags of fragrant Genovese and Violetta basil for as little as four dollars, and you can find beets the size and color of a man’s heart. Like any good marriage, beets couple with basil beautifully with both partners maintaining their own strength of character while complementing the flavor profile of the other. I love the way the anise-like undertones of sweet basil lift the earthiness of fresh beets, transforming what could be an intense and robust dish into something decidedly lighter and fresher. Beets are a deeply nourishing food, rich in anthocyanins which account for their extraordinary vivid color. These pigments appear to offer some anticarcinogenic benefit. Moreover, among common vegetables consumed by Americans, beets harbor some of the highest levels of cellular antioxidant activity1. Combining the nutrient profile of beets with antioxidant-rich basil and unrefined extra virgin olive oil seems a fitting pairing. While this beet salad recipe can be prepared with a single variety of beet, consider using a variety of beets to visual interst to the salad. Red beets tend to be the most earthy in flavor with definite overtones of soil, while white and golden beets offer a milder flavor coupled with more pronounced sweetness. And everyone loves the charming Italian Chioggia beets with its brilliant pink candy-cane stripes. Similarly, consider using several varieties of basil in the beet salad – adding greater visual interest and more complex flavors to the dish. With over twenty varieties of basil widely grown, there’s ample opportunity for experimentation. Beet salad with fresh basil and olive oil, sweet and fresh and earthy, becomes the center of our supper tables in late summer and early autumn when both beets and basil appear at market in abundance. Steam the beets over rapidly boiling water until they become tender, about five minutes or so. If using multiple varieties, note that the red beets will stain the other varieties so you may wish to steam them separately. Once tender, immediately plunge the steamed beets into a bowl of ice water, allowing them to chill until completely cool. Drain the beets, patting them or spinning them dry as necessary. 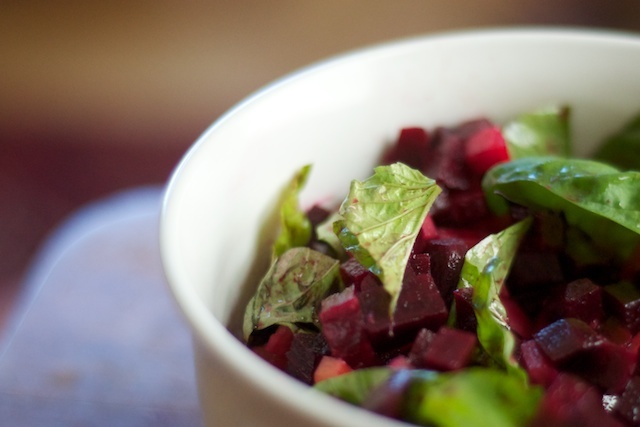 Combine the drained beets with chopped basil, minced garlic. Dress with vinegar and olive oil. I’d serve this with a chicken dish. I think it would overpower the salmon a bit and can’t quite imagine the flavors meshing well. Dark chicken meat would be delicious with this. I don’t see what or where you added the beet greens. I would chop the stems into 1/4″ pieces and roughly chop the leaves and add that to your salad.